SCE-SHZ series refers to the SCE products whose output type is screw hole. Its rated voltage is 2.7V, capacity range from 360F to 600F. Due to the internal thread terminal type, this series supcap should be connect by bolts,and the maximum torque is 4N * M. With a cycle life of 1，000,000 cycles, SPSCAP SCE-SHZ Series Cells can be rapidly charged and discharged over and over again, making them one of the most energy efficient, environmentally friendly, and cost effective ways to store energy. 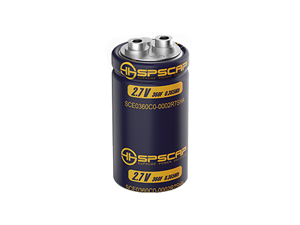 SCE farad ultracapacitor as well as other spscap capacitors has long storage time. After charging, although there is a bit current leakage, which occurs during the movement of ions and protons inside the capacitor under the influence of electric field, without any chemical or electrochemical reaction, therefore no new material is produced. Besides the electrode material is stable in the corresponding electrolyte. So the storage time for super capacitor can almost be unlimited. The series ultracapacitors widey used in Wind Turbine and smart grid energy store enjoy high reputation around the world. Like most models, 360 Farad ultracapacitor adopts a fully sealed structure, with no vitalization of water or other liquid, so 360F ultracapacitor is maintenance-free during the whole service life and becomes an ideal back-up power supply for pitching control system of wind turbines.